No time in your busy day to fit in a yoga class? We are happy to come to your place of business to teach your team during your lunch hour! These 50 minute ”lunchtime” classes combine yoga poses with a touch of breathing and meditation, teaching your team various stress-relieving techniques which they can utilize both during their work day and in their home life. The yoga asanas themselves are tailored to aid in both flexibility and strength, with a focus on the lower back, hips, shoulders, wrists, posture and overall alignment; common “problem” areas associated with time sitting at a desk. This program has been designed specifically to address stress and will assist your team in feeling energized, calm and more focused. There is enormous pressure on teenage girls to have the “perfect” body, as dictated by the media. This societal concern along with natural hormonal fluctuations can cause girls to not recognize, be comfortable in, or like their changing bodies. Yoga can help them get in touch with themselves physically, mentally and emotionally. These Teen Classes will include rhythmic breathing and meditation, teaching the students a natural way to manage their daily stresses and inherent mood swings. Learning to breathe correctly now will help develop lifetime tools to quiet the mind and calm anxieties. A supportive, non-competitive atmosphere will help the girls to discover their personal yoga practice, and that they alone are responsible for feeling good about themselves. Posture also will be a key focus of these classes, as it can deteriorate during these years due to time on electronics and carrying heavy backpacks. We will also work on helping the girls realize the strength their bodies already have (or can build through yoga), which enhances their personal power and self esteem. As the girls continue to grow, their bones lengthen and often their muscles do not keep up. This can cause a loss in flexibility. Yoga helps to maintain or increase their flexibility, which is important for general health, but which also is key to sports injury prevention. Yoga is a perfect compliment for all body types, including young dancers and athletes whose muscles are strong but also short, and therefore lack flexibility. These Introductory Classes will progress from initially learning and understanding the asanas (postures), to linking them together (almost like a dance), using the breath. Ultimately the class will be a flow style of yoga to help the girls get out of their busy minds and into their bodies. Our goal is that these young women will learn to be present and mindful, to appreciate the beauty of their own bodies, and to feel strong and confident. And along the way, we promise to have a lot of fun!!! Hatha Yoga uses a combination of physical postures (Asanas), breathing techniques (Pranayama) and meditation (Dyana) to improve overall physical health and mental well-being. At FYB, we use our breath to link poses together creating a more fluid class than your typical static longer held Hatha. Focusing on both strengthening and stretching, the postures aid in increasing circulation in the organs, glands, and tissues while promoting supple muscles and spine. This in turn brings you back into proper alignment which leads to improved flexibility and balance (both physical and mental). A regular Hatha yoga practice will assist you in creating a strong yet flexible body, and a calm and uncluttered mind. A little more challenging than Hatha but not quite as difficult as a Vinyasa class. Meditation and breathwork are infused into this class and combine with traditional Hatha poses to create flows or Vinyasas. This class is suitable to all levels as it will not contain too many challenging planks or Chaturangas. These fun classes will encourage children ages 6 – 9 to strengthen their mind-body connection as well as understand their breath (belly, chest, fast, slow) and it’s varying effects on mood, emotions, etc. Quiet mindfulness will be explored along with many busy yoga games and kid-friendly variations of poses. The classes will be held Mondays 2:30 – 3:15 in the Lower Lantzville studio. Please call Elizabeth directly to register at (250) 802 4402. Do you own a business or work in Lantzville or North Nanaimo? If so, then this in-studio “middle of the workday” class could be perfect for you. We focus on opening the hips, improving posture, toning the lower back, releasing the shoulders, and other issues associated with sitting at a desk. There will be a meditation component as well as various Pranayama or breathing techniques taught, assisting in relieving stress and anxiety. The poses themselves will be of Hatha origin, but will flow together, utilizing the breath to create greater flexibility. What a terrific way to break up a day at the office!! This is an opportunity to come and sit and meditate for 30 minutes in a group. The session will be unguided, just bring a cushion and enjoy being among fellow meditators as we create community while raising our collective vibration. 5$ drop-in which will be donated to charity at the end of each month. You are an experienced meditator with an established daily practice. We are an intimate international group led weekly via Skype by an enlightened meditator with more than 30 years experience. Please call to discuss the possibility that you are a good fit for this class and the time and day it is being offered. This series is for expectant mamas looking to deepen their awareness of their changing body and connect to a community of women on the same journey. Each class will include a gentle movement practice, breathing techniques and tips on nourishing your body and your baby pre-birth. Taught by a nurturing pre-natal nutritionist / yoga teacher. Restorative yoga helps to regulate your nervous system, slow down brain waves, and provide calm conditions for deep healing and rejuvenation to occur. Its prolonged and profoundly nourishing postures are practiced close to the floor and fully supported by the use of a variety of props (blankets, bolsters, blocks, etc.). Gentle Pranayam (breath) practices are incorporated to further ease tension and quiet your mind. This class is suitable to all levels and often accessible to those with injuries. Vinyasa yoga improves your strength, flexibility and balance while teaching you to use your breath to move from one pose to the next. These 75 minute classes incorporate fun and cardio as you take common Hatha yoga poses and string them together creating a vigorous flow of movement. A meditative component will also be included. A great way to get and stay in awesome shape!! This class is equally challenging and nourishing. Creative sequencing helps your body to flow through poses linking movement with breath. You will work hard, building strength while also regenerating with a Yin pose or two. A delicious Savasana closes off this balancing practice. Yin Yoga focuses on gently stretching the deep connective tissues (ligaments, cartilage, bones and joints) as opposed to actively stretching AND strengthening the muscles as we do in Hatha. This is a much more physically passive style of yoga, targeting the connective tissues of the hips, pelvis, and lower spine areas. As we hold the poses anywhere from 3 to 8 minutes, the class becomes quiet and meditative. We move to an internal place of focus, allowing ourselves to listen to our busy minds. This can at times be difficult, but we sit with it, and as it becomes easier we hear new messages from within. Our Yin practice also helps us to “re-boot” our system, assisting in re-opening our energy paths as we release energetic blockages. Over time with a dedicated Yin practice, you will find that you will achieve greater range of motion as you lengthen the connective tissue. You will also find that at the end of your Yin class you will be infused with a sense of serenity, calm and emotional / energetic balance. Got stress? Yin – Yang is what you have been searching for! This class begins with a combination of breathwork and meditation, relaxing you and quietening the mind right from the start. Yin poses follow, deeply stretching the connective tissues only, not using the muscles whatsoever. Half way through the class we bring a Yang or active component to the class, changing our focus to the musculature by utilizing Hatha poses. We finish with a restorative supported reclining twist followed by Viparita Karani “Legs up the Wall”, again focusing on taming mental and emotional stress and anxiety. The resulting combination is a feeling of having stretched and strengthened your muscles while deeply relaxing your connective tissues, AND turning off the internal chatter…pure bliss! A perfect way to “Find Your Balance!”. In this age of stress and stress-related disorders, the technique of yoga nidra (yogic sleep) serves as a boon for humankind by inducing deep physical, emotional and mental relaxation. By systematically training the mind to remain calm and quiet and by rooting out repressed thoughts and desires which lead to pain and disease, we can awaken creativity and promote learning, reduce anxiety, hostility and insomnia, and even help address psychosomatic disorders which lead to asthma, coronary heart disease and cancer. The profound healing potential of yoga can be enhanced with Healing Light Yoga by bringing one of the ancient secrets of Ayurveda to life with through the union of consciousness (pure awareness), breath and subtle intention. With an introduction to a specific type of breath called the Healing Breath, when combined with and specific gentle asana, is a powerful yet gentle way of creating flow and directing energy into the parts of our body that need the most love. Heal from the inside out. Join us for a deeply rejuvenating series, integrating the restorative benefits of yoga Nidra with an introduction to the health-giving effects of healing light yoga. Yoga Nidra is practiced in a comfortable reclined position with the body supported by props. The student becomes completely relaxed by following a set of audio instructions read by the Nidra teacher. These words when followed without actually falling asleep, invite the practitioner to become systematically and increasingly aware of their inner world. This state of consciousness is different to meditation in which concentration on a single focus is required. Yoga nidra is among the deepest possible states of relaxation while still maintaining full consciousness and has been found to reduce tension and anxiety. Perhaps you don’t have time on a regular basis to make it to a group yoga class, or you feel that personalized one-on-one attention from your teacher is what you are looking for. These classes are designed to fit each student’s individual physical, emotional and scheduling needs. Please contact Elizabeth for more details including pricing information. Registered Classes are $11.25 each and are available in 8 week Sessions. Please contact Elizabeth for details. The cost for an 8 week Session including GST is $90.00. Some specialized classes / workshops (Teen, Pre-Natal, Ayurvedic Cooking Classes, Monthly Restorative Sessions, etc) may have a different fee structure. For example, Teen Sessions run 3 times during the school year with breaks during holidays. These 10 week sessions have a cost of $120. Please email, text or call Elizabeth for details or questions on other types of special classes. Mar 4 – May 3 (we will be closed for the week of March 18 – 22 for Spring Break) This is still an 8 week session. 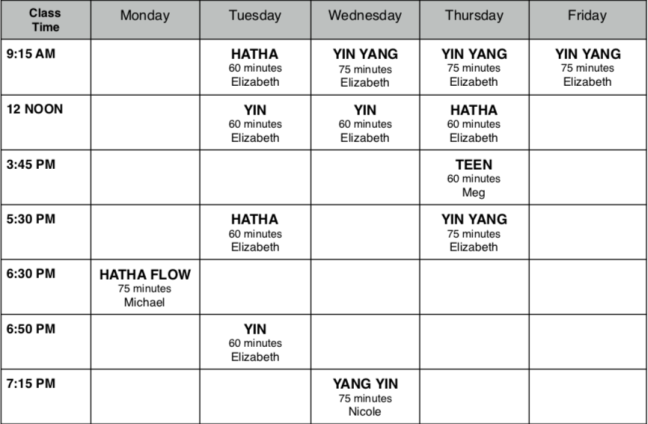 1 registered class per week for 8 weeks = $90. 2 registered classes per week for 8 weeks = $170. 3 registered classes per week for 8 weeks = $250. If you miss a Registered Class we encourage you to make it up within the same session. Please email Elizabeth directly to check availability for making up a class. Sadly no refunds are available for missed classes. If we need to close for safety reasons due to snow, please schedule a make-up class. Alternatively a credit will be applied to your next session fee. Thank you for your understanding. If you know you are going to miss a class in advance, please inform us, so that others who are trying to make up a class have greater opportunity. Thank You!! Drop-in price for any class is $15.00, including GST. There is also a 10 Class Punch Card available for $125.00. If you prefer to drop-in this may be the option for you. However your attendance will be subject to availability in each class, with priority given to Registered Students first. For classes that are full, this would mean being available on short notice when a Registered Student cancels. 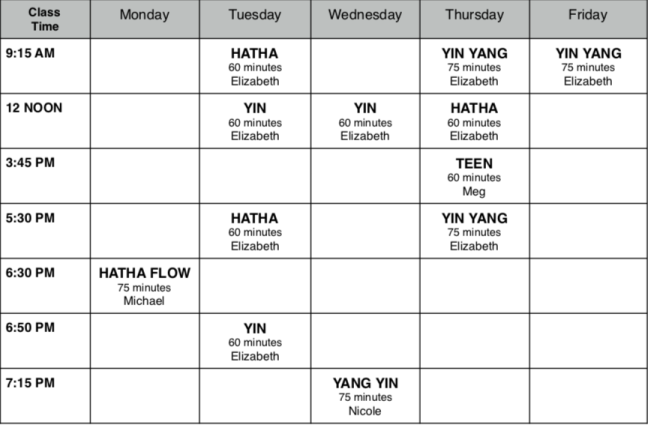 To register or drop-in to any other classes, or to book Corporate, Private and Semi-private classes, or if you have any other inquiries please contact Elizabeth at FindYourBalanceYoga@gmail.com . All private sessions subject to 24 hour cancellation notice or full fee will be charged. We gratefully accept cash or a check made out to Elizabeth Stenning. Thank you. Our studio rental fees are very reasonable as we aim to assist new teachers and innovative programs in succeeding. Please email FindYourBalanceYoga@gmail.com for details. Some restrictions may apply.